Mechanical presses serve ably and have applications where they are the ideal choice. But servo-driven presses often get the call in demanding applications and bring whole new levels of flexibility. When choosing, consider this input on energy use and ROI. Understand where and when to opt for coil springs rather than nitrogen-gas springs, then follow the best-practice guidelines here to ensure long, safe and effective spring use. For fabricators of metal and beyond, these machines deliver flexibility and performance at reasonable costs. And they're more dependable than ever. Effective nesting for CNC punching and cutting requires careful consideration of numerous factors, including fabrication requirements such as collision avoidance and clamp management, and order sequencing and kitting. 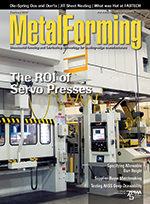 Follow these best practices to develop an effective sheetmetal-nesting strategy. Advanced high-strength steels have proven their mettle in automotive and other applications. A key to success in forming these tough materials lies in proper testing. Using the MFG.com contract-manufacturing marketplace to source machined and fabricated-metal parts pays off big time for glassware OEM Anchor Hocking--$70,000 in savings over 41 RFQs in just 14 months.